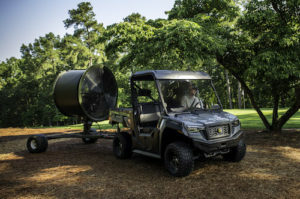 Textron Specialized Vehicles (TSV) launched its new Cushman Hauler 4×4 utility vehicle. The Hauler 4×4 series features a 2,000-pound towing capacity, 1,500-pound payload and 1,000-pound cargo box. The dash includes a multifunction display that communicates vehicle performance and diagnostics. Hauler 4×4 models offer several storage locations, including behind and under the seat, and a glove box ideal for transporting gear. The Hauler 4×4 is available as a three-person vehicle; the Hauler 4×4 Crew accommodates up to six people. Both models are available with either a 50-hp gas engine or a 25-hp diesel engine. Electronic power steering is standard on Crew models and is available as an option on three-passenger models. Standard features include high/low-beam headlights, LED brake lights and taillights and a locking rear differential. Hauler 4×4 series vehicles can be equipped with many options and accessories, including a glass windshield, canopy, center seat console, under seat storage, a rear-view mirror and more.